I’m a big fan of great gaming music. It can add so much to the gameplay, the story and the characters. And there’s one more. My favourite. 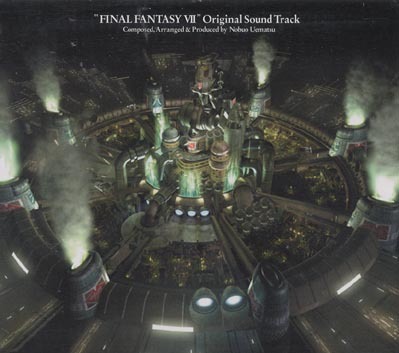 By one of the greatest composers of all time, Nobuo Uematsu, “Final Fantasy VII” Original Sound Track is by far one of his best works. This soundtrack has many famous pieces and also has some the most recognised music in video game history; including Those Who Fight, J-E-N-O-V-A, Opening ~ Bombing Mission, Aerith’s Theme and most importantly, One-Winged Angel. Since FVII has been released, there have been other games and media that are a part of the compilation. For example, Crisis Core and Advent Children. The sounds of the original music still lives on in these OSTs. One-Winged Angel has also received great remakes. I’d also like to give an honourable mention to Final Fantasy VI’s OST (also composed by Nobuo) for the great pieces Dancing Mad and Opera – Maria and Draco. You’d be interested to know what happened when I met Nobuo Uematsu last month. A question you may be asking is what did I get signed? Well THIS one of course!